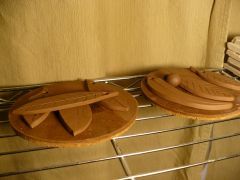 Some future earthy Christmas ornaments. 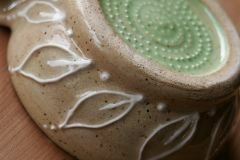 Planning some simple pottery glazes in brown and white, and some maple leaves in bright underglazes. Wheel thrown and hand carved. 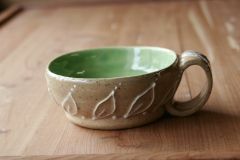 The bottom features a leaf design created by using paper leaves as a resist to the underglaze. 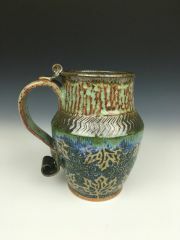 Sgraffito designs were added along with a pulled handle and spiral embellishments. Fired to cone 6 in an electric kiln. 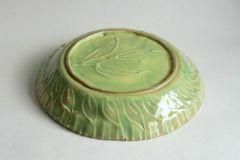 This is a special pie plate made with two tones of casting slip. 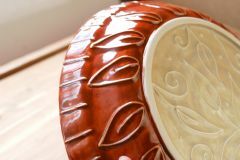 I then decorated it with leaves and swirling vines in slip and sgraffito carving on the inside. 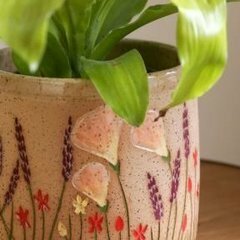 This is one of my very first wheel-thrown pieces. It's made with Speckled Buff from Laguna and slip trailed with white. Even just in the three months since I threw this I can see a huge leap in both my throwing and slip trailing. So grateful to finally see progress! Again, one of my first wheel-thrown pieces. 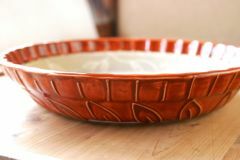 Made with Speckled Buff, I painted white slip into the inside of the bowl so the color would show true, then slip trailed a design on the outside in white slip. I was not prepared for the shrinkage! It still throws me off. 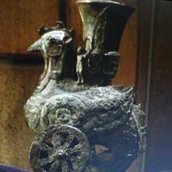 But this would be a charming hot chocolate cup or great for dessert or ice cream. Slip cast in Moroccan Sand slip, then decorated with white slip trailing.